Practical information on foreign companies has become a must for modern companies and their advisors. An increasing number of companies are establishing foreign branches and subsidiaries or acquiring interests in other companies situated abroad through mergers and joint ventures. Such cross-border operations are not restricted to big, multi-national companies. On the contrary, more and more small private or family-owned companies seek to expand their businesses and to establish foreign-based contacts. As a result, no serious businessperson or corporate advisor can afford to be without information on international corporate law and practice. 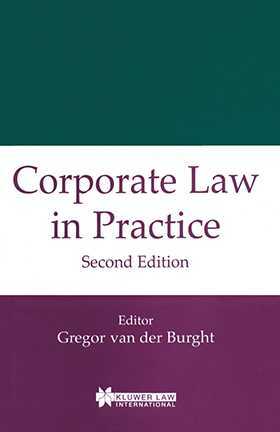 Corporate Law in Practice, now in its second edition, supplies the kind of practical information tax consultants, shareholders, company executives, financial advisors, businesspeople, and members of the accounting and legal professions need to keep abreast of and conversant with this growing trend toward involvement with foreign companies.